This is a tool used to form hollow plastic products, such as bottles and cans. Typically of aluminum, blow molds contain either tubular water jackets or drilled cooling lines. Isolated areas, such as threads or pinch edges, can contain steel inserts to enhance durability. Blow molds are equipped with the means for injecting air into the cavities. Blow molds are used to mold an article to a desired shape. 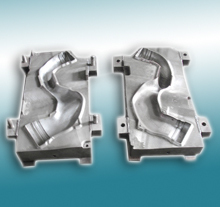 The blow mold contains a cavity shaped for the outside of a blow-molded part to conform to. A blow mold consists essentially of a cast or machined block with a cavity, cooling system, venting system, pinchoffs, flash pockets and mounting plate. The choice of material for the construction of a blow mold must take into account such factors as thermal conductivity, durability, material cost, the resin being processed and the desired quality of the finished parts. Commonly used mold materials include beryllium, copper, aluminum, ampcoloy, A-2 steel and 17-4 and 420 stainless steel. Blow molds are used to produce small and large containers, bottles, bellows, toys and other specialty products using a broad range of plastic resins.